Facing my fear… with unexpected help! I had a love-hate relationship with summer because of it. I know, I know. GASP! How can anyone hate summer? I hated the storm part of summer. I usually didn’t mind it if my whole family was home with me, but my adrenalin would spike if the sky got really black or they started to talk tornado on the radio. I’m the one who has the tornado stuff all prepared in the basement in the summer. That’s not a bad thing mind you. Being prepared never is, but being afraid is. You can have a healthy respect without fear. Okay, enough back story. This summer everything took a 180 degree turn. Why you ask? Come on… ask! Because of these two guys! 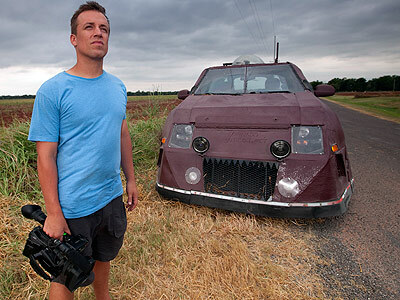 For those of you who don’t know who these guys are: On the left is Greg Johnson, the Tornado Hunter, and on the right Reed Timmer, Storm Chaser. (I’ll include the links to their awesome websites at the bottom of this post.) So I didn’t know these guys from Adam. I think that’s how the expression goes. I used to watch Reed on the Discovery Channel do what he does best, but it’s been a while. This summer we had some wild, and I do mean WILD, weather in our province. It seemed like there were tornado warnings every other day. Last year we had 3 tornadoes. This year we’re already up to somwhere between 26 and 31 and the season might not even be over. If Reed Timmer visits your neck of the woods it’s usually a good sign something intense, weather wise, is going to go down…. especially if he arrives in the Dominator (seen above). This summer there was a round of storms that was looking scary (even to the cool, calm storm chasers). Greg started talking about warnings that were coming out two or three days in advance. So, my adrenalin and anxiety kicked into high gear. 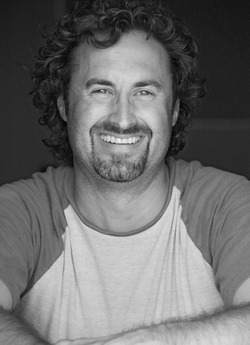 I found out the Greg and his AWESOME team and Reed had live feeds (link below too… be sure to check it out). I liked the idea of being forewarned so after getting the tornado stuff ready, I sat in front of the computer and watched to see what it was all about. By the end of the day, I was hooked. My fear of storms now included a slight curiosity. Well, like I mentioned, we had just a few tornadoes around here this summer. I spent time ‘arm chair chasing’ with these guys. Each new storm got rid of some of my fear and added a bit more curiosity… and then excitement. I wasn’t excited that others might be in danger, but there’s something about seeing a tornado live (and knowing it’s only about 30km away) that makes it pretty amazing. The chases were intense, amazing, exciting, frustrating and incredible… and I was just sitting on my couch! I was able to check off two boxes on my ‘Summer Bucket List’ when I got to meet Greg and Reed this week. It was awesome! These guys are passionate about what they do! They are working hard to learn more about these storms and to inform and teach you and I. They’re always out there speaking and meeting with people. I have a terrible memory so I’m not word for word on this but Greg said ‘being informed can take the fear out of it’. I could not agree more! It’s amazing how a little knowledge can put you at ease. Here I am, sitting on the couch, and as I write this I am feeling a bit sad that the season is drawing to a close. At least up here. I’m even considering signing up to ride along with Greg next summer. Wow, what a change a summer can make! Thank-you to Greg Johnson and Reed Timmer and your awesome teams and all you amazing storm chasers for helping make summer my favourite season! Your turn!! What about you? Did you get a chance to watch Greg and Reed this summer? I’d love it if you would leave me a comment and share this blog. Thanks! Here’s those links I promised! These guys are awesome! This entry was posted in Weather and tagged anxiety, blogs, chasing, dominator, learning, lessons, nature, outdoors, reed timmer, storms, tornado hunter, tornadoes. I experienced a tornado once … it came through 2 buildings down from the Pizza Hut I worked at in Gulfport MS. I remember the noise like it was yesterday. As I opened the rear door to the restaurant, I observed everything flying parallel to the ground. Thank God we were not open for business yet as myself and another employee took cover in the walk-in cooler. We could hear roof tiles ripping and windows breaking. It was only after the dust had settled that we learned just how close it came to us. I have to say, the experience was full of different emotions and needless to say, we didn’t open for business. However, we did open our doors to victims in need of food and shelter. I can only imagine how scary that would be. I imagine that seeing everything flying parallel to the ground would be somewhat alarming! Thanks for commenting Adrian! I am a bit different than you, I have always loved storms. I had been following the guys all summer also on the computer and one day got really lucky. I actually was in an area where Reed was going to be and ended up talking to him for half hour or so and then followed him in my vehicle for the day. It was July 3rd it was the day he cut his head open and a day I will never forget. We saw 1 tornado that day and also met up with greg. I recently met both of them at the football game and they are both amazing people and very friendly. I really wish I could do what they do but I guess I will live through the computer watching them, or get lucky enough to meet up with them next year again. Thanks Trevor for the great story! That was quite the day when Reed cut his head open. I saw it on the computer but it was still intense. I am jealous that you were out there and saw it all live (not so much Reed gashing his head) but the chasing. That’s awesome! It would be amazing to do that, especially with great guys like them. I, too, will live vicariously thorough the computer… for now. I hope someday I can get out there and see it first hand! I have been a weather watcher forever and I too had a fear of tornadoes…for no reason. But weather fascinated and still fascinates me. Last year my fear came full cirlce. I was in an EF3 tornado! In Massachusetts! I was in my cellar when it hit and it was because of people like Reed and Greg that I knew what to do, where to take cover, and how to survive. I lost my home and car in 60 seconds, but I’m alive to tell about it! I still watch them live. It still scares the bejesus outta me (PTSD). But I learn from them and they do good things for people. To warn them of potential storms and to study the storms and learn more about them. Plus they both have a great sense of humor and seem to be really great guys. I hope some day you get to go on a chase and see a tornado up close but not be “in it.” Thanks for the great blog! Wow Gail, that is an incredible story. I can imagine that faced with the same situation, I would be pretty terrified too. I am so glad that you made it through that encounter. It is so important to know what to do in those situations. I’m glad that I am learning to know the signs and how to handle it should I ever find myself in the same situation. Thank-you for sharing! Greg and Reed are both really stand-up guys. They were fun to meet and super down-to-earth! Best thing I did to learn what I was looking at was to take a FREE NWC SkyWarn spotter class. I know you are in Canada, but perhaps you can find one in the states near where you are. AWESOME class. Made me feel a whole lot more “in control” during storms now. Thanks Sarah!